I am so fortunate; my life is full of surprises. Every day something extraordinary comes my way. A few weeks ago, I received this letter, out of the blue. I didn’t know what it meant but it resonated in me. This is the story about a young child who needs our help. If you can do something, please do. Even if it’s as simple as sending the family your good wishes and prayers. There is an amazing story about a child with a rare form of dwarfism on the Mississippi Gulf Coast. This family has brought a community together with hope of inspiration and a message that anything is possible. Please take a close look at little Levi Krystosek’s story. This child is going to be the key in a medical breakthrough for those suffering Jansen’s Metaphyseal Chondrodysplasia. I met Levi Krystosek when he was four months old. Levi’s family had just lost everything in Hurricane Katrina and they were resettling into a new home. At the time, no one knew for sure what was wrong with Levi; all the doctors were stumped. This was a time of uncertainty for everyone but for the Krystosek family it was literally a new beginning, the biggest challenge of their lives. Levi was diagnosed with Jansen’s Metaphyseal Chondrodysplasia just three days shy of his first birthday. Can you imagine not knowing what is wrong with your child for an entire year and having 12 doctors say, “I just don’t know, let’s wait and see what happens.” I can’t. 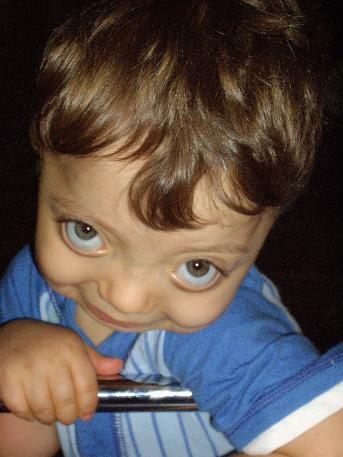 Jansen’s Metaphyseal Chondrodysplasia is a very rare form of debilitating dwarfism. Levi is the 17th person in the world known to have this type of dwarfism. There are three different types of gene mutations that can cause Jansen’s. Levi is the fourth ever documented with his type of mutation. Unfortunately, Levi’s is the most aggressive. You would think that so much devastation in such a short time would devastate such a family but not the Krystosek family. They are stronger and more determined than ever to fill their lives full of hope and promise and want to share their belief with the world that, “Anything is possible.” Levi’s mother, Dona Krystosek, spends most of her time toting Levi around to several different specialists around our nation to give Levi the best medical care possible and to also educate others, especially children, about differences in people. Her message is that we’re all the same but some just face different obstacles in life. To raise awareness for Levi, Dona has introduced Levi to her community and they’ve rallied around Levi and truly believe anything is possible. Dona receives invitations to meet others inspired by her story and also photos and words of encouragement from people all over the world. She’s decided to share Levi’s story and blog his progress on-line. Please read Levi’s story and follow his progress at http://www.littlelevi.com/ or contact Dona Krystosek at (228) 697-4624. Because of Dona’s determination, family and community support, she has found her needle in a haystack. Dr. Craig Langman of Children’s Memorial Hospital in Chicago believes Levi is the perfect candidate for a wonder drug that could actually cure Levi’s symptoms. Dr. Langman and Levi’s family are currently awaiting FDA approval on this hopefully life changing drug therapy. Senator Thad Cochran is also helping any way he can. His staff has embraced Levi and his family and has invited them to Washington D.C. for a visit. This is an uplifting story that gives people hope and encourages them to take a look at their own lives. Too many people feel overwhelmed by all the turmoil in the world in which we live today. Let’s spread some love, hope and joy and smile at what life truly has to offer. Please help us spread the word about Levi and the hope that he, his family, and others may have very soon with the FDA’s approval of this drug therapy. If I can be of any assistance, please fell free to contact me at any time. This entry was posted on Monday, October 27th, 2008 at 4:38 pm and is filed under Uncategorized. You can follow any responses to this entry through the RSS 2.0 feed. You can leave a response, or trackback from your own site.